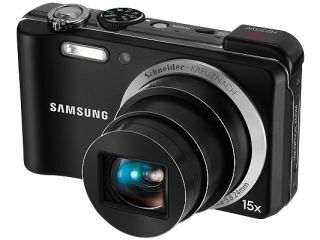 Far from the madding CES crowd, Samsung has announced a number of new compact cameras, beginning with the WB650 and WB600 range. Both models squeeze a 12.2MP sensor into their diminutive frame, carry wide-angle 24mm Schneider lenses and have an impressive 15x optical zoom to play with. Flip the camera over and you are presented with a lovely looking 3.0-inch AMOLED display – Samsung's fancy pants word for OLED. Giving the WB650 and WB600 range OLED capabilities means that you will be able to see the screen in bright daylight and it will go a long way in making sure the battery life of your camera lasts that little bit longer. Other features include the ability to geo-tag your images – handy for those who forget if the pictures they are looking at are from Morecombe Bay or Sharm El Sheikh. There's also an Optical IS function which should stabilise your images when you have the shakes from the night before and there's also some Digital IS on board just in case the optics can't keep your images blur-free. Samsung has also added a 720p movie mode function. With a release date of March, the Samsung WB650 and WB600 range for a penny under £300 and £250 respectively.